Continuing from Critical Thinking 1, various themes and situations are introduced to young children reinforcing their knowledge, extending their view of the world, and improving their vocabulary skills. 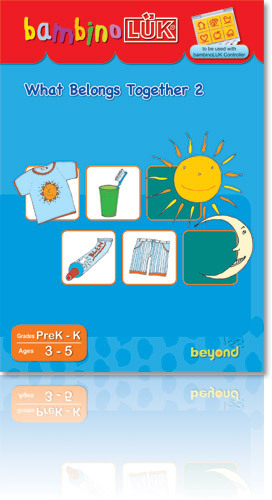 This workbook is designed to help children discover and understand the connections between objects and various activities in their environment. This ability to associate is critical in intellectual development. All exercises are based on things children are familiar with, thus reinforcing their existing knowledge, extending their views to the exciting world, and encouraging development of this important skill. Children love to discover new things in their environment. For young children at this age, however, putting related objects together is not an easy task. First, they must recognize the objects using colors, shapes and their general knowledge regarding the objects. It is then necessary to determine the relationship between these objects. This ability to associate plays an essential role in children?s intellectual development. 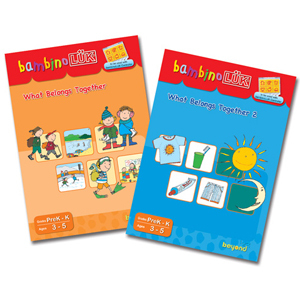 This workbook, which is a sequel to ?What Belongs Together?, helps children discover and understand the connections among everyday objects and various activities in their environment. It carefully encourages this developing ability without overwhelming the child. All exercises are based on what children usually are familiar with, thus reinforcing their existing knowledge and extending their views to the exciting world.